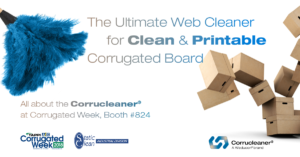 The Final Web Cleaning Solution For Corrugated Board And Cardboard. By cleaning in the right spot in your production process and stopping contamination before it reaches a point where you can do nothing about it anymore, Corrucleaner® ensures a clean, debris-free surface that compensates for fluctuation in liner quality. Compared to other webcleaning solutions, Corrucleaner® is up to 20% more efficient with energy consumed. Electronic control of flow and volume by means of frequency converters allows to use only the energy needed for the desired performance. Mechanical control of flow and volume by means of a valve generates heat and resistance at the cost of wasted energy. 5 dB lower noise level, a healthy working environment because of lowered emissions, reduction of contamination on the work floor and less time used for cleaning and maintenance, optimise labour conditions and work safety. Increased numbers of passes between wash-ups, less dust complaints and improved printability raises customer satisfaction and improves your market position. The enlarged output combined with better quality gives additional profitability. Although the Corrucleaner® is virtually maintenance-free, our customer support assures that the advantages of the system can be held upright for years and years. Annual maintenance by the constructors keeps your system fit. Continuous use of the Corrucleaner® enlarges the complaint-free output of your corrugator. The effective reduction of dust, debris and substrate related remains optimises the surface quality of the corrugated produced. Fluctuations in liner quality is compensated, the printer can rely on constant conditions and optimal quality. Producing corrugated board or cardboard? Chances are that you are looking for a way to improve the quality of your product or the production process itself. If so, read on. All professionals in the line of corrugated production know: debris, fibers, slitting dust and foreign particles cause problems and cost money. All moving webs and sheets generate a static charge, all mechanical contacts with knives, dies, rollers – the forces used to generate web tension and edge guiding – result in the same things: contamination, loss of quality, customer complaints and costly maintenance and cleaning. Maybe the most important virtue of the Corrucleaner® is its spectacular web cleaning capability, resulting in very clean and printable board.